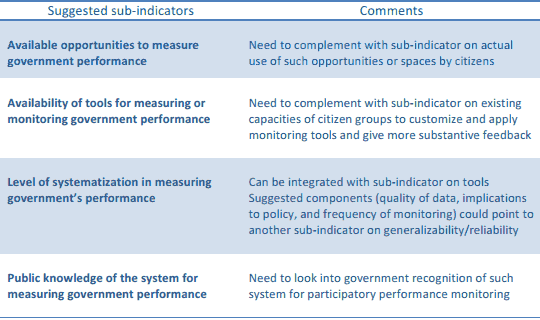 In the first installment of this blog post, we shared our initial observations of existing governance indexes and social accountability assessment frameworks. Our analyses point to possible considerations in establishing a niche for the SAc index. First off, there seems to be some space for a regional assessment framework in East Asia and Pacific. We need to inquire though if there are enough bases for such cross-country measurement. Looking at how accountability is viewed, the SAM in Tanzania provides an excellent peg for a more citizen-oriented assessment approach. Finally, our preference for a simple but comprehensive tool means a SAc index would probably rely more on direct data from stakeholders, and include both input and result indicators. It is within the context of the proposed SAc index or assessment framework serving as a mechanism for stakeholder dialogue that the more normative aspect of such a project comes to the fore. In other words, apart from asking what the SAc index’s use or value will be for network partners, it is important also to ask what the regional secretariat’s agenda is for this project. We propose the following: 1) Provide push towards scaling up of SAc initiatives (through expansion of focus to other PFM spheres, and aggregation of findings for policy work); 2) Promote enhanced focus on the rights and interests of poor, women, and other vulnerable groups (in selecting areas for monitoring, customizing the tools, mobilizing groups, evaluating results); 3) Facilitate more programmatic learning and knowledge sharing as strategies for sustained SAc practice. Other concerns: 1) Partnership building as aspect of the SAc index development process, towards ensuring buy in and substantive participation; 2) Coming out with a good mix of methods for data collection and analysis; 3) Inclusion of poverty- and gender-sensitive indicators (voice, power to influence decision-making, access to services, control over productive assets, etc. ); 4) Building capacities for data gathering, collaborative analysis, and strategic communication of assessment results. We would love to read your reactions, comments, and suggestions here in the coming days. Capuno, Joseph J. and Maria Melody S. Garcia 2008. Can information about local government performance induce civic participation? Evidence from the Philippines. A UP School of Economics discussion paper (Discussion Paper No. 0808, August 2008). University of the Philippines Diliman: Quezon City, Philippines. Global Integrity 2011. Global Integrity Report: 2011 Methodology White Paper. Global Integrity: Washington, USA and Cape Town, South Africa. Hyden, Goran, Kenneth Mease, Marta Foresti, and Verena Fritz 2008. Working paper 287: Governance assessments for local stakeholders: What the World Governance Assessment (WGA) offers. Overseas Development Institute (ODI): London. Policy Forum Tanzania 2007. Addendum to the PF Strategy Paper: Incorporating Social Accountability Monitoring. Policy Forum: Dar es Salaam, Tanzania. Downloaded from the Policy Forum website (http://www.policyforum-tz.org). Transparency International. Corruption Perceptions Index 2012: Short Methodology Note. From TI website (http://www.transparency.org/research/cpi/overview). UNDP Oslo Governance Centre 2009. A User’s Guide to Measuring Local Governance. UNDP Oslo Governance Centre: Oslo, Norway. United Nations Development Programm (UNDP) 2008. 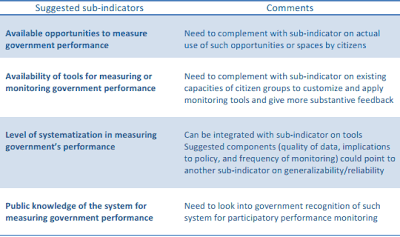 Methodology for measuring the index of responsibility, transparency, and accountability (RTA) at local level. UNDP: Skopje.